You probably are ready to say goodbye to checking the oil, yanking the start chain, monitoring the gas, and enduring the noise of your gas mower. You can’t even listen to a podcast with that thing on! Still, the best reason to buy an electric lawn mower is that it’s one step closer to a carbon-neutral existence. Do your little part to halt climate change—if you need a mower, buy electric. Hands down, the best electric lawn mower is the Ego Power Plus Mower. We’re basing this on reviews, reliability, and the fact that we believe in the company. EGO isn’t a traditional mower company with an electric line. They aren’t an electric tool company that also makes mowers. EGO focuses on electric lawn products, and that focus shows in their products. What we like about the EGO is the obvious thought that went into the design. The EGO folds up into a rectangular shape that’s not only easy to get home from the store, but takes up less space in your garage. The EGO has a ridiculously simple height adjustment system that’s as easy as shifting an automatic car from park to drive. The EGO’s powerful lithium-ion battery charges in just 30 minutes, and mows for 45. Plus, the battery fits their other tools…if you have a little charge left over, use it to blow away some leaves. You can tell a lot about a company from its customers, and EGO’s are passionate ones. On their site they host an active community where fellow EGO owners help each other with questions or troubleshooting. Let’s start with the bad news upfront. 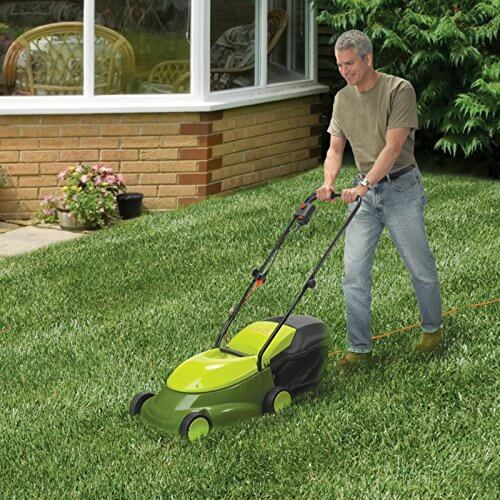 The Sun Joe 14-inch corded electric mower looks like a toy. For some reason they’ve made it this pastel green color, it’s housed in fairly cheap feeling plastic, and at 29 lbs. is about the weight of a Radio Flyer red wagon. But you don’t care! You have a teeny lawn, it’s not going to take you long to mow it, and you’ve got better ways to spend your money than the extra horsepower of more expensive mowers. The Sun Joe gets good marks from people like you. Fussy, unreasonable people complain that it’s not powerful, that it looks cheap…guys, it’s an $85 mower. Others expect it to mow wet or tall grass like a gas mower can. This won’t end well. Nor will having the improper extension cord. Electric mowers need special heavy cords, they won’t work with the extension cord you use for your holiday lights. Basically, if you follow the instructions and don’t expect too much, your Sun Joe will do the job. Have You Considered A Robot Mower? Of the robot mowers on the market, the best is the Husqvarna Automower line. Husqvarna is a terrific company, and their robotic mowers are a good choice if you have a really large lawn (and would save you tons of money versus paying a landscaping service). But—the Automower starts at $1,995. Are Electric Lawnmowers Any Good? Yes, electric mowers are good. If your lawn is in decent condition, gets dry enough to mow, and isn’t subject to infestation by excessive amounts of falling twigs or pinecones, and isn’t serving as the putting surface for The Masters, an electric mower will do just fine. The main thing that should excite you about an electric mower is energy efficiency. You can use the same electric power that powers your hair clippers—power which in many states is increasingly generated with renewable resources. You’ll save money by using an electric mower, and you’ll also be doing your part to save the Earth. Electric mowers will provide the quietest lawn care experience of your life. One of the worst aspects of mowing the gas-powered way is that, unlike with other outdoor work like weeding, raking, fence post digging—you can’t listen to music or the ballgame while you do it…even through headphones. With your largely quiet electric mower, noise pollution’s at a minimum. You can enjoy your favorite form of aural entertainment, and your neighbors will have peace and quiet. Like any mechanical product, electric mowers are prone to the occasional breakdown. Most mowers carry a warranty that protect you against product defects. Any mower will need blade sharpening at some point. The known durability issue with electric mowers is that—if you choose a cordless one—the battery will eventually lose power. Most companies also offer a warranty on the battery as well, but the fact is that, like your car battery, it will need to be replaced every few years, depending on how much you use it. A cordless mower simply needs its battery charged to run properly. Mower batteries vary in how long they take to charge. How long they will run depends on the terrain of your yard and how long your grass is. The longest-running cordless mower on the market, the EGO, runs about 45 minutes. Ego’s 7.5 amp battery looks like something you’d find on the Millennium Falcon. If you buy a corded electric mower, you can mow for as long as you like, but you must use a high-rated extension cord. Extension cords are rated by the size of the wires within, or wire gauge. The sizing isn’t very intuitive: the lower the number, the thicker the wire, and thus the more power can run through the cord. The size you’ll need will depend on the mower you buy, and how far away from your outlet you plan to mow. Consult the owner’s manual before you mow to avoid blowing a fuse. This is the fun part. Let’s count the reasons you should choose electric mowers over gas ones. 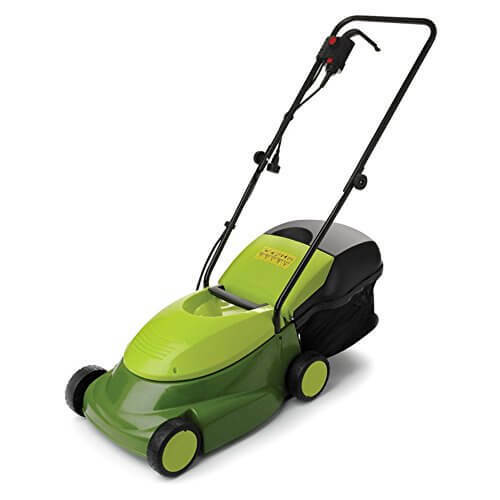 Top-of-the-line electric mowers cost about the same as self-propelled gas mowers. Given that electric mowers are much lighter, and require very little exertion to push, you’re basically getting the same product without the hassle of using gas. On the low-end, electric mowers are cheaper than gas ones. You’ll have a tough time finding a gas mower for less than $150, while you many choices at that price point with electric mowers. The least-expensive electric mower we were able to find you can get for less than $100. Gas has electric beat on pure mowing performance. The engines of gas mowers are more powerful, so they are going to do better with tough mowing tasks like high grass, wet grass, and debris. If you deal with these situations—you’re either going to stick with gas or buy a very high-end electric mower. The EGO runs at 3300 RPM, which is comparable to gas mowers. But the average person, with a relatively basic lawn, doesn’t notice any difference in performance between a gas and electric mower. Using a corded electric lawn mower won’t save you much in energy costs—Consumer Reports estimates that you’ll save around $15/year. But you will be using cleaner energy—instead of polluting the air around your home with gas fumes, you’ll drop your emissions to zero. Most cordless electric lawn mowers now come with lithium-ion batteries, replacing the lead-acid batteries that most had used. Lithium ion batteries are longer-lasting and lighter than lead-acid batteries; on the other hand, they aren’t as powerful and cost more. Some models, like the Black & Decker CM1936ZA 36V Cordless Lawn Mower, still use lead-acid batteries to generate a little more power. However, it’s 90 lbs; some cordless mowers weigh as little as 30 lbs. Because your mower is creating torque with electric power rather than through internal combustion, it’s much quieter. Most make hardly any noise at all. The power of the motor depends on the voltage of the battery—the higher the voltage, the more powerful the motor. You’ll spend more for a more powerful mower. Most electric mowers on the market have some sort of mulching capability, with a bag to capture the mulch or by shooting the clippings out the side of the mower. Don’t expect an electric mower to shred twigs, pinecones or other debris the way a heavy-duty gas mower might. Most electric mowers on Amazon are available used on their site as well, usually at a 10-25% discount. You’ll find a pretty good selection on Craiglist as well. Just about everyone has a mower, and if they move or trade up they’ll sell theirs for a decent price. You do need to be careful, though, if you buy a used cordless electric mower. The batteries of cordless models wear down over time, taking longer to charge and not holding as much of a charge. If you are buying a used cordless mower, you might ask for a test drive to see just how much battery power is left. Going electric isn’t just about ease of use. It’s also about doing the right thing for the Earth. Along with choices like avoiding unhealthy chemical fertilizers, mowing your lawn with electric power will reduce your footprint on the only world we have.